Using the latest multi-core processors in integrated modular avionics (IMA) programs is a perfect solution for consolidating avionics applications and reducing size, weight, and power (SWaP) on next-generation platforms. However, multi-core processors pose many more system implementation and certification challenges than typical single-core or multiple discrete processor solutions. 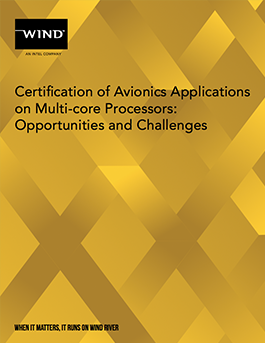 This paper provides guidance on the certification challenges of multi-core solutions as well as an update on work at Wind River® to develop commercial off-the-shelf (COTS) RTCA DO-178C DAL A certification evidence packages for VxWorks® 653 3.0 Multi-core Edition platform.